This entry was posted in energy for human development and tagged decision theory, energy, energy for human development, energy mix, HDI, human development index, millennium development goals by manuelgarciajr. Bookmark the permalink. The book is available as a free PDF file. 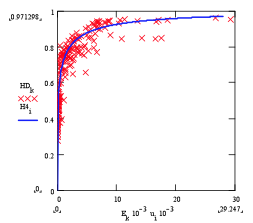 The hyperbolic tangent HDI model from EFHD Report #1 is used in part 2 of the ADB book (“Energy, The Common Denominator,” figures 32, 33). The ADB’s discussion of the movement in the HDI-energy plane by selected lower HDI Asian countries, from 1995 to 2002, is interesting and shows how the HDI-energy model (curve) helps one interpret national trends. This article is my best effort toward a theory of ecologically sustainable industrialization, that is to say the use of (exosomatic) energy by human society. I hope some young engineers and mechanics out there pick up on the suggestions made here, and make clever uses of solar (and wind and water) energy, and applications of thermodynamics, heat transfer and thermal diffusivity, which are both technically simple (which means they may be very intellectually challenging to devise — but isn’t this a joy for engineers?) and make significant improvements to the conditions of human survival for those at the bottom of the energy ladder and HDI scale. The “development” in my phrase “energy for human development” is only secondarily in reference to economic and infrastructure expansion; it is primarily in reference to the expansion of the freedom of individuals to develop themselves intellectually and socially because of their greater access to energy from ecologically clean sources, which would be applied to easing (removing?) the burdensome chores of survival. has been used by a number of authors since it first appeared on the Internet (in HTML format, in Microsoft’s “htm” version) at http://www.idiom.com/~garcia/EFHD_01.htm [now a legacy web site]. “Awaan” is impassioned, and makes a spirited and probing case for clean government that can expand access to electricity economically and efficiently for the benefit of the large portion of low-HDI Pakistanis. I’m glad to see my EFHD_R_01 used in this way. I first posted EFHD_R_01 on the Internet on 28 April 2006.